This doll commemorates the Apollo-Soyuz Test Project (ASTP) the first international space project. On July 15, 1975 Cosmonauts Leonov and Kubasov launched into orbit in Soyuz 19. Later that day, Apollo astronauts Tom Stafford, Vance Brand, and Deke Slayton docked with Soyuz and orbited together for 2 days. 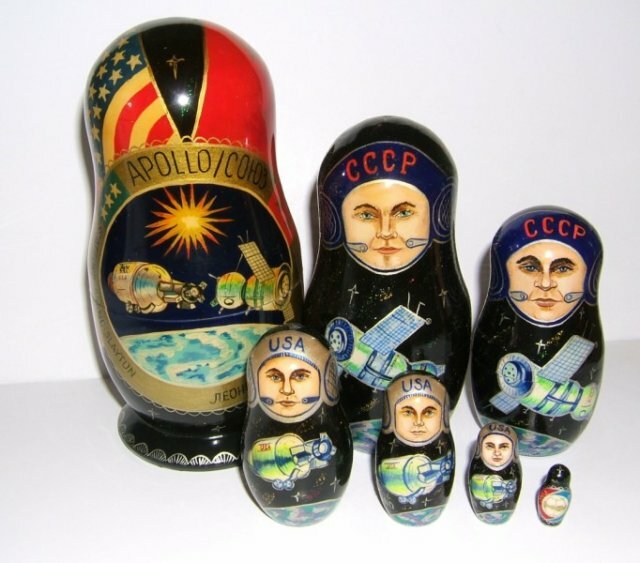 This doll features the historic docking of the two spacecraft, the two Russian cosmonauts and three USA astronauts and the project logo on the smallest doll. Made in Russia in 1996.